If I just listen to the Illinois Suffer the Wrath EP titled Divine Sign, without partaking into the visuals, I imagine a group of guys delving in their brutal death metal very seriously. Concerned a lot more with playing tight, and devastating you with the fullness of their sound, Suffer the Wrath do not give any nods to slowdowns or going overly melodic on Divine Sign. At the same time their death metal is quite technical, with quick stops/restarts (Slave King, Buried in Blood), engaging fast fingered leads (title track, Buried in Blood) and playing it all with blistering speed from start to finish. If there are some vestiges of old Swedish death metal or melodeath leads (title track), they are certainly not pushed into the foreground. Yet there is an interesting flowing weave to this aggressive speedy riffing. More than anything Divine Sign reminds me of later era Kataklysm (without overt melodies, again), especially because Suffer the Wrath are fond of the Quebecois hyperblast percussion and using dual vocals, a la Maurizio Iacono. There is high raven-like shriek alternating with the throatier deathly growl on multiple occasions on the EP. In summary, if I don’t check out the dudes’ attire, this is some fundamental technical death metal being played here. But then, if you look at the horned helmets hiding the faces, Samurai armor, shouldered hammers, the players’ nicknames (Wretchlok the Destructor, Lord Payne, Drakon, Sinister Hell), I start wondering, if Suffer the Wrath are going to be the Manowar or Gwar of death metal. Perhaps all of that get-up works well for a live show where aural devastation is unleashed with Minotaur horns charging fully into the crowd. 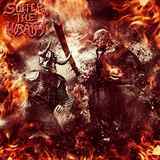 With or without the looks, with or without the drenched in blood lyrics, if hard-hitting, dense, modernly sounding, but without the extensive polish, death metal is calling for your name, give Suffer the Wrath a listen.